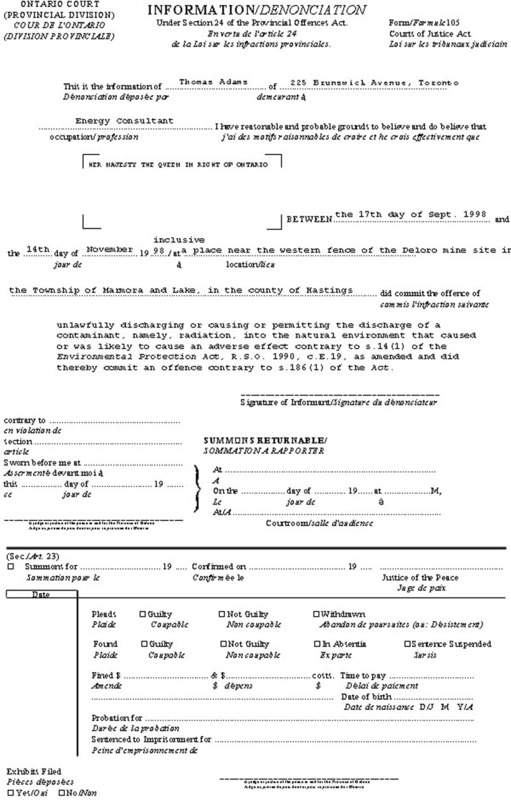 [the company or individual], between the nth day of 1999 and the yth day of 2000, at or near [location of offence], did unlawfully carry out a work or undertaking, to wit, operating a D-9 Cat in a stream in a manner that resulted in the harmful alteration, disruption, or destruction of fish habitat, to wit, [name of stream], contrary to Section 35(1) of the Fisheries Act, R.S.C. 1985, c. F-14, as amended, and did thereby commit an offence contrary to Section 40(1)(a) of that act. You should include the words “as amended” following the citation of the legislation to take into account any amendments that may have taken place since the act was proclaimed.